Make your dreams come true with 31 original and surreal designs. 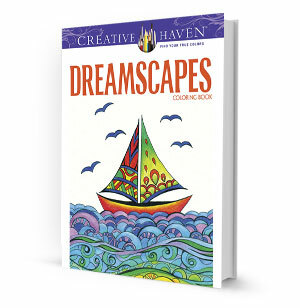 Offering hours of challenging and creative coloring fun, these abstract and figurative illustrations include landscapes of densely wooded forests of pop-art vegetation, sailboats, and butterflies floating on psychedelic seas, vibrant fantasy gardens, and more. Pages are perforated and printed on one side only for easy removal and display.